Color(s):Blue or blue-mottled with or without other markings; red speckled. Puppies are born white but get their color within a few weeks. The Australian Cattle Dog today is a versatile breed, it is known for being a courageous and tireless worker, a friendly and intelligent companion and a loving family pet, but it was originally bred in Australia for droving cattle in difficult terrain for long distances. This breed should be treated with love and care, if harshly treated they are known to bite at times and are also aggressive with other dogs. Despite of this they are a loyal breed and they respond quite well to training. 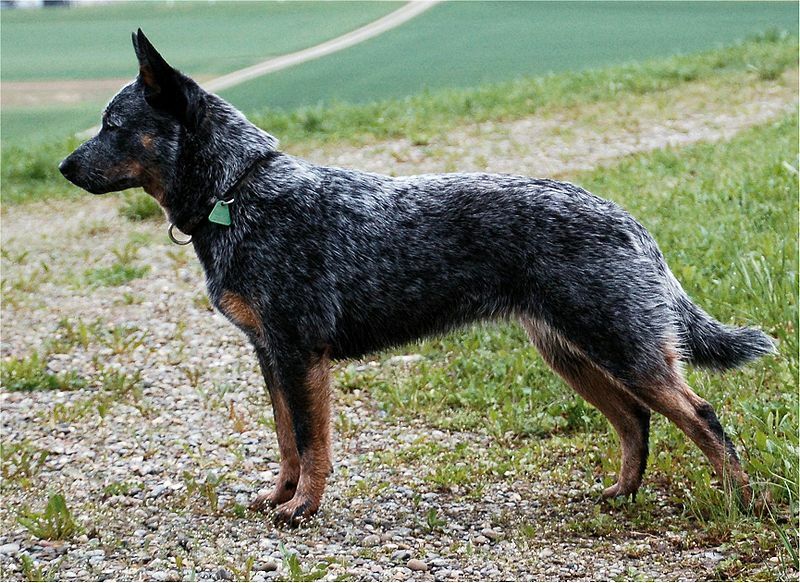 The Australian Cattle dog is also known as Blue Heeler, Red Heeler, and Queensland Heeler, it originated during the 19th century and has today become one of the three most popular dog breeds in Australia. The australian cattle dog has an average lifespan of 11.7 years. The most common dog diseases affecting the Australian Cattle Dog are musculoskeletal in nature (spondylosis, elbow dysplasia, and arthritis), reproductive (pyometra, infertility, and false pregnancy) and blindness. Fractures, lameness and cruciate ligament tears are also a health problem with the Australian Cattle Dog.